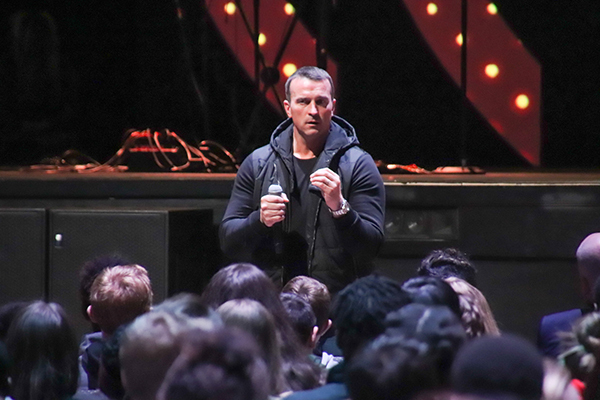 The Maryland Heights Police Department sponsored an all-school assembly for Pattonville High School featuring Chris Herren, who realized his lifelong dream of playing in the NBA only to lose it to drug addiction - first alcohol, then cocaine and oxycontin and finally heroin. The presentation was designed to provide a personal look at the dangers of substance abuse. Maryland Heights is sponsoring the same presentation for Pattonville middle school students in April. Herren was a high school basketball legend from Fall River, Massachusetts, who was named to the 1994 McDonald's All-American team. After losing his dream job as an NBA player, Herren refocused his life to put his sobriety and family above all else and has been alcohol- and drug-free since 2008. He shares his story of abuse and recovery in his memoir, “Basketball Junkie,” as well as in numerous interviews throughout the ESPN Films documentary “Unguarded,” of which he is the subject. Herren also shares his story with student and community audiences in the hopes of reaching just one person and making a difference in his or her life. Pattonville students viewed a video about Herren’s story. Herren then shared more in person about his life and recovery, along with messages encouraging students to be the kind of person who is a role model for their younger siblings or students. A short question and answer session followed.